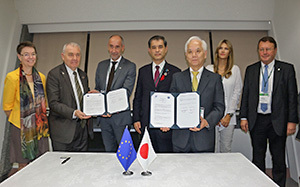 Japan Science and Technology Agency (JST) and the European Commission's DG Research and Innovation signed an Implementing Arrangement (IA) for research exchange between JST and the European Research Council (ERC) on 7th October 2018 at Kyoto International Conference Center. In January 2018, a discussion about possible collaboration between JST and the ERC was made between the then Minister Hayashi (Ministry of Education, Culture, Sport, Science and Technology (MEXT), Japan) and Commissioner Moedas (Research, Science and Innovation, European Commission). Acknowledging the successful cooperation framework between Japan Society for the Promotion of Science (JSPS) and the ERC, further opportunities for research exchange through a new framework between JST and the ERC was considered. The signing ceremony was witnessed by the current Minister Shibayama (MEXT) and Ambassador-designate Flor of the European Union to Japan. Enhancement of research outcomes is expected by providing institutional opportunities for research exchange between the researchers strategically supported by JST and the excellent researchers in Europe with grants from the ERC.